24 June 2009, at 10:09a.m. AUSTRALIA - A cooperative initiative between the Commonwealth Department of Agriculture, Fisheries and Forestry, Animal Health Australia and the poultry industry has produced the first biosecurity manual for the poultry industry, entitled <em>National Farm Biosecurity Manual - Poultry Production</em>. The purpose of the manual is to establish a minimum set of biosecurity standards, applicable to all poultry producers (including ratites). While the manual was produced with commercial producers in mind, the principles of good biosecurity apply to any poultry or bird-raising operation. Individual producers and companies may wish to develop enhanced biosecurity manuals, which should nevertheless incorporate these minimum standards in addition to any specific company or industry sector requirements. In the context of this manual, the term 'poultry' is used to cover fowl, turkeys, guinea fowl, ducks, geese, quails, pigeons, pheasants, partridges, ostriches and emus reared or kept in captivity. The manual applies to poultry enterprises from the time of delivery of birds, until pick-up, slaughter or disposal of live birds. While the manual stipulates the minimum requirements for any poultry farm, it should be noted that biosecurity measures in place on breeder farms would generally be much more stringent, reflecting the economic importance and the extended life cycle of breeder flocks. The pick-up of birds and transport to the processing plant is covered in a separate appendix. At the second Government–Industry Avian Influenza Forum held in Canberra on 11 June 2008, a draft Generic Farm Biosecurity Manual was presented to industry and jurisdictional representatives. It was agreed that the manual filled an important gap and should be adopted by all industry sectors as the base document upon which sector specific manuals should be developed. The sector specific manuals must, as a minimum, satisfy the requirements stipulated in this generic manual but may provide more specific guidance or additional requirements that reflect the characteristics of the industry sector. Implementation is the responsibility of each poultry industry sector and several industry associations have already commenced adapting the generic manual to their specific operational circumstances and requirements. 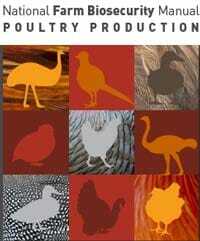 The adoption of the new Primary Production and Processing Standard (PPPS) for Poultry Meat, currently being finalised by Food Standards Australia New Zealand and to be implemented over the coming years by all states and territories, presents a good opportunity to promote adoption of the biosecurity standards set out in this manual. While the biosecurity requirements in this manual are in some areas broader than strictly required from a food safety point of view, it is the group’s expectation that adoption of the measures stipulated in this manual will meet the PPPS requirements for the production phase. Ratites are not covered by the poultry PPPS. Biosecurity requirements in that sector are largely mandated by the requirements of its export markets. The egg industry has a Code of Practice for Biosecurity (Grimes and Jackson, Rural Industries Research and Development Corporation, 2001), which is currently the industry standard with respect to biosecurity. This standard was used to develop the third party auditable EggCorp AssuredTM programme (ECA), which also includes food safety, environmental and welfare operating practices. In order to implement the objectives of this National Farm Biosecurity Manual, the egg industry will incorporate the objectives and ensure that requirements of this manual are incorporated into the ongoing development of these aforementioned documents. In general, implementation of this manual relies on each poultry industry sector achieving the objectives as indicated. The development of sector specific practices is fundamental to the success of improved biosecurity for the entire poultry industry. It is acknowledged that each production system will have a different spectrum of biosecurity challenges and operating environments, which must be addressed with relevant approaches based upon the objectives identified within this manual. - You can view the full National Farm Biosecurity Manual - Poultry Production [PDF; 957 KB] by clicking here.